Sore or painful arms are common but should not be taken lightly. Pain in any part of your arms can prevent you from carrying out your daily activities. You use your arms for just about everything, such as lifting, holding, grabbing, and throwing. Mild pain in the arms is usually the result of a poor sleeping position, poor blood circulation, exercising or playing sports, or repetitive motions. Some possible causes of severe arm pain include a pinched nerve, sprain, tendonitis, rotator cuff injury, broken bone, rheumatoid arthritis, angina and even a heart attack. Depending on the cause, the pain may start suddenly and go away or it may increase gradually. 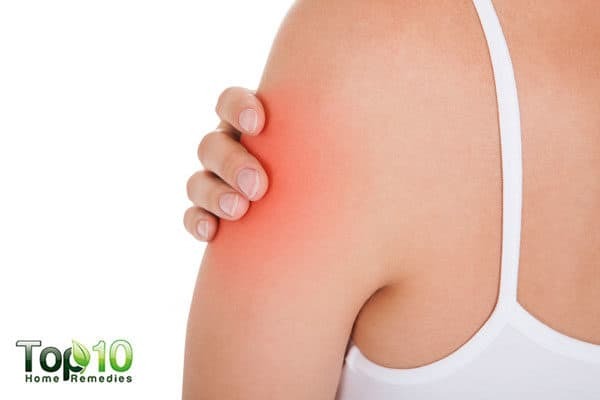 Apart from pain, other symptoms associated with arm problems include swelling or cramps, redness, stiffness and swollen lymph nodes under the arm. The symptoms can be in one or both arms and can affect the wrist, elbow, and shoulder. Minor arm pain usually resolves on its own. Also, there are a few natural remedies that can help you deal with arm problems and pain, and help your arm to heal. Caution: See a doctor immediately if the pain is severe. 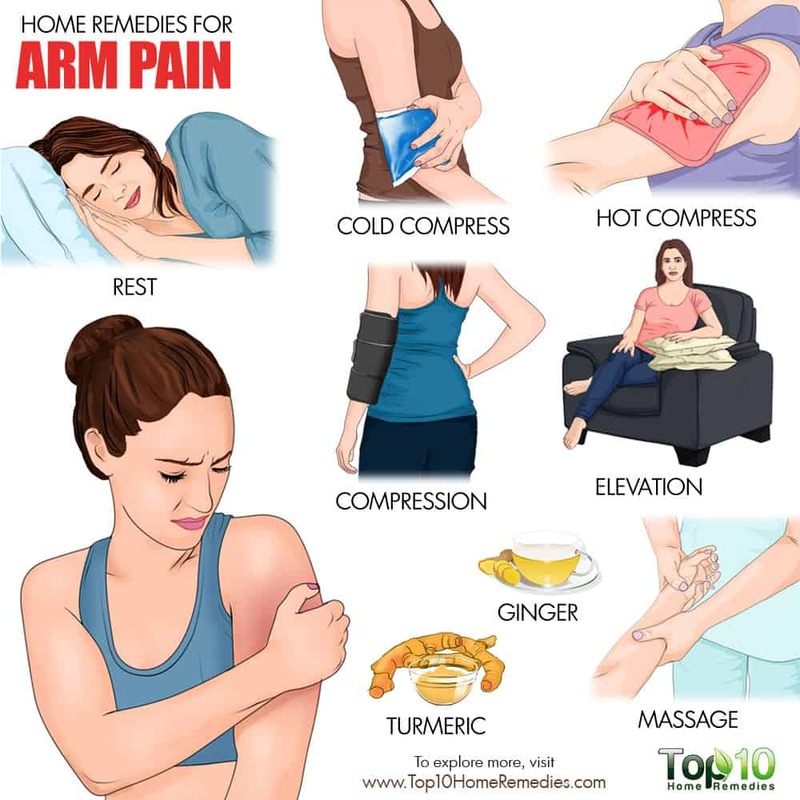 Here are the top 10 home remedies for arm pain. For mild arm pain, the best thing you can do is rest. Proper rest is a key component for repairing soft tissue damage that often occurs with minor pain. On the other hand, ongoing strain will cause more inflammation and pain, and delay the healing time. For the first 24 to 72 hours, allow the painful arm to rest as much as possible and avoid strenuous exercise and movement. Also, do not type or do anything to make the sore arm feel worse. This will ensure quick reduction of swelling. Arm pain can be treated with cold compresses. However, it is effective primarily during the initial stage. The cold temperature helps make the tissue in the painful area numb, therefore alleviating pain. It also helps reduce inflammation. Put some ice cubes in a plastic bag and wrap the bag in a thin towel. Place it on the affected area for 10 to 15 minutes. Repeat a few times daily for a few days. You can also soak a towel in cold water and apply it on the painful arm. Caution: Do not place ice directly on the skin. It can cause frostbite. 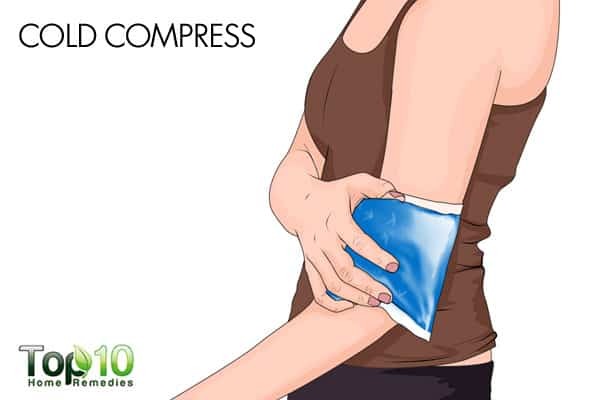 Just like cold compresses, hot compresses can help treat arm pain. 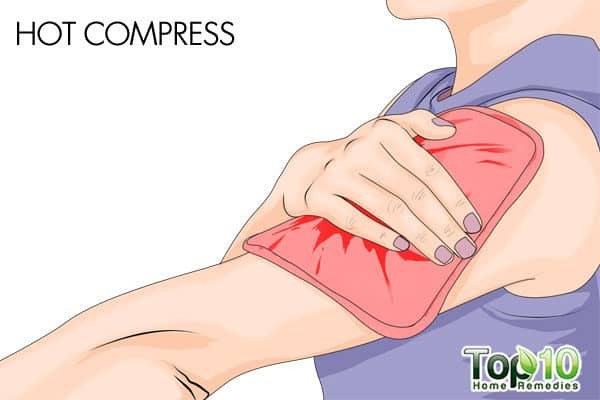 However, for the hot compress to be effective, only use it after 48 hours from when the injury occurred or the pain began. Heat increases the blood flow to the area, which in turn will decrease stiffness and pain. Fill a hot water bag with hot water and apply it on the aching arm for 10 to 15 minutes. Repeat a few times a day until you get complete relief. Also, you can stand in the shower and run warm to slightly hot water on your arm for 5 to 10 minutes. Do this twice daily. Wrapping the affected area with a compression bandage or elastic bandage can help reduce swelling and encourage healing. Compression puts even pressure on the painful area. Also, it gives ample support to your painful arm. It even helps you move around more comfortably. Compress the affected area by wrapping it with an elastic bandage, which you can buy from the drug store. 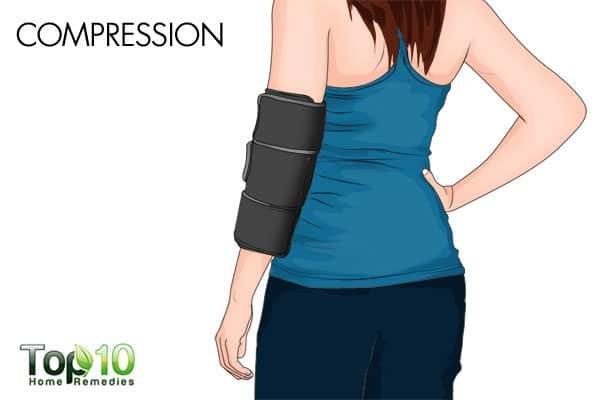 Use the compression wrap for a few days, or until the pain and swelling are gone. Caution: Do not wrap the area too tightly. 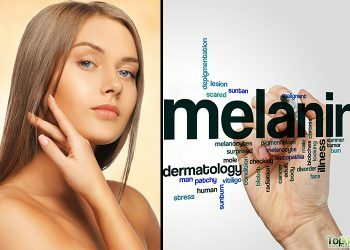 It can lead to poor circulation and worsen the condition. Signs that the bandage is too tight include numbness, tingling, increased pain, coolness or swelling in the area below the bandage. Sometimes, the best thing you can do to reduce arm pain is to keep the painful area elevated. Elevation promotes proper blood flow to the area and elimination of waste products to speed up the healing process. It also keeps pressure off the injury, makes you more comfortable and provides support. 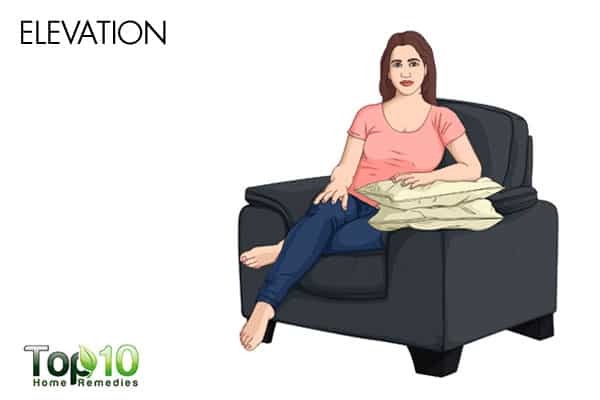 Use 1 or 2 pillows under your arm while resting or sleeping. If necessary, use a sling to keep your arm elevated. Caution: Do not elevate your arm so high that you don’t get adequate blood supply. Massaging the affected area using gentle pressure can help with pain. Massage improves blood circulation, which in turn helps repair the damaged tissue faster. A gentle massage also helps release stress and tension in the area. Warm up a little sesame, mustard, coconut, or olive oil for a few seconds in the microwave. Rub the warm oil on the painful part of your arm. 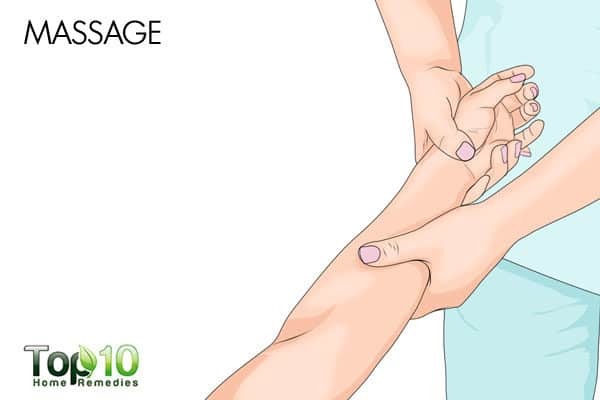 Massage gently using a little pressure to increase blood circulation and relieve pain. Do it a few times a day for several days. You can also go get a massage regularly from a professional, which may prove helpful. Caution: If massaging hurts too much, don’t do it until your pain level decreases. Ginger is also effective for reducing arm pain, due to its anti-inflammatory and antioxidant properties. It helps eliminate inflammation of any type, including in the arm and shoulder. It also boosts blood circulation to speed up the healing process. A 2010 study published in The Journal of Pain found that daily intake of ginger can help lower muscle pain following an exercise-induced muscle injury (1). 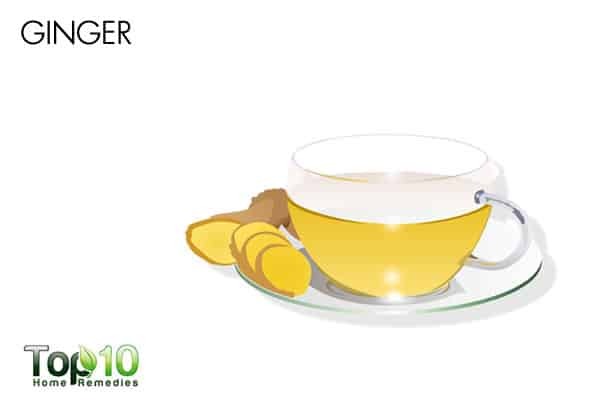 For internal use, you can drink up to 3 cups of ginger tea daily. To prepare ginger tea, put 1 teaspoon of chopped ginger in 2 cups of hot water, cover, and let it simmer for 5 to 10 minutes. Strain it, add honey for taste and drink it while it is still warm. For external use, wrap 3 tablespoons of freshly grated ginger in a piece of cheesecloth. Put the bundle in hot water for 30 seconds. Allow it to cool, then place it on the painful area for 15 minutes. Repeat a few times daily until you get relief. Turmeric is another good home remedy for arm pain. A compound known as curcumin in turmeric contains antioxidants and anti-inflammatory agents that work well to reduce swelling and pain. In a 2011 study published in the Journal of Biological Chemistry, researchers found that the compound curcumin in turmeric can be used to suppress biological mechanisms that spark inflammation in tendon diseases (2). For external use, make a paste by mixing 2 teaspoons of turmeric powder with 1 teaspoon of coconut oil. Rub the paste on the painful or swollen area and let it dry. Rinse the dried paste off with warm water. Do it at least twice a day. 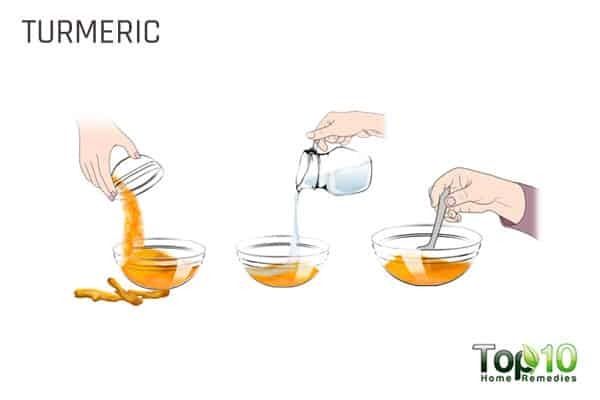 For internal use, mix 1 teaspoon of turmeric powder into 1 cup of boiled milk. Sweeten it with honey. Drink it 2 times a day. 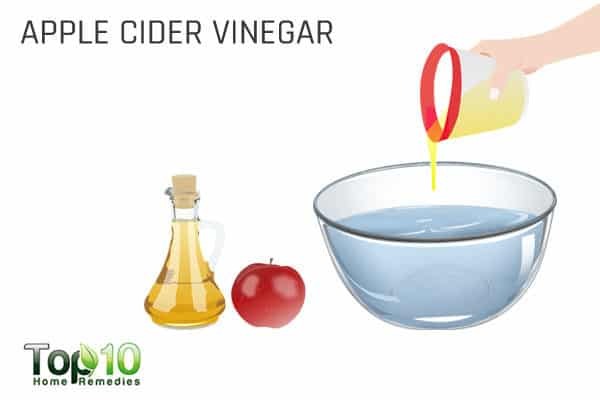 Apple cider vinegar is another effective home remedy that can help relieve pain in your arm. It has alkalizing and anti-inflammatory properties that help reduce swelling and pain. Additionally, it provides powerful mineral properties to the body that may help treat sore muscles and other muscle conditions. Add 2 cups of raw, unfiltered apple cider vinegar to a bathtub of warm water. Soak your body, especially the painful arm, in this water for 20 to 30 minutes. Enjoy this relaxing bath once daily for a few days. Also, drink a glass of warm water mixed with 1 tablespoon of raw, unfiltered apple cider vinegar and a little honey twice daily for 1 week to promote quick recovery. Cayenne pepper is another good remedy for any kind of pain, including arm pain. The compound capsaicin in it has analgesic and anti-inflammatory properties that help reduce pain as well as swelling and inflammation. Mix together ½ teaspoon of cayenne pepper powder and 1 tablespoon of lukewarm olive oil. Apply it on the affected area and massage gently for 20 or 30 seconds. Rinse it off after 10 minutes. Use this remedy twice daily until the pain is gone. Alternatively, you can use over-the-counter creams containing capsaicin to massage the affected area. 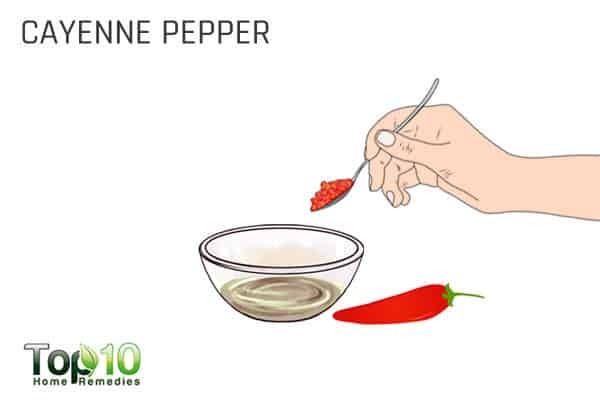 Caution: Never apply cayenne pepper on broken or irritated skin. For pain due to inflammation, take anti-inflammatory medications like corticosteroids to help reduce the pain. For mild pain and swelling, over-the-counter pain medications like aspirin, ibuprofen, naproxen and acetaminophen can help treat your discomfort. Opt for physical therapy, particularly when you have a limited range of motion. Stretch regularly, particularly before exercise, to reduce the risk of pain in the arms. Make sure you have the correct form for the exercises you’re performing to prevent injury. Always make sure that the equipment you are using to exercise or do sports with is correct for your ability level and size. Eat fruits like cherries and blueberries to help soothe sore muscles. 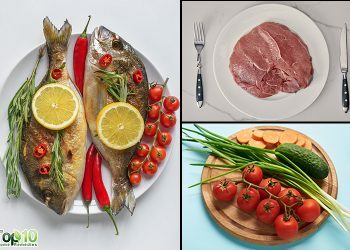 Follow a protein-rich diet so that your muscles can rebuild sufficiently after training or competing. Due to pain, the arm, hand and fingers can swell a lot. Be sure to take off rings, bracelets, watches and all other jewelry. If you are having arm pain due to muscle cramps, be sure to drink enough water. At times, dehydration can cause muscle cramps that can be felt in your arms. 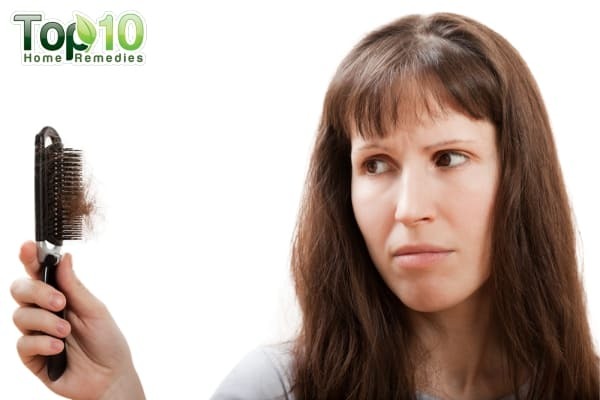 Control stress, as too much stress can weaken your body’s defenses and make it harder for your body to repair itself. When exercising, use the proper positions and movements to avoid straining muscles, joints, or tendons. Daily ginger consumption eases muscle pain by 25 percent, study suggests. ScienceDaily. 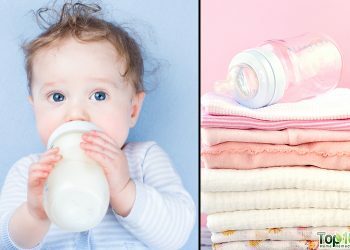 https://www.sciencedaily.com/releases/2010/05/100519131130.htm. Published May 20, 2010. Accessed March 07, 2018. ROLE OF THE PHOSPHATIDYLINOSITOL 3-KINASE/Akt PATHWAY. Journal of Biological Chemistry. http://www.jbc.org/content/286/32/28556. Published August 12, 2011. Accessed March 07, 2018. VERY IMPORTANT AND USEFUL ADVISE. WELL DONE. Very helpful. My friend has been complaining of arm pain for about two weeks. Maybe one of your remedies will help.